As a nation of pet lovers the British often define themselves as either dog lovers or cat lovers; some people are of course keen on both but anyone who likes our feline friends should appreciate Kitty Glitter from IGT. It’s an online slot totally devoted to cats with plenty of cute pictures and an exciting soundtrack. Kitty Glitter is a five reel and thirty payline game which, as well as being dedicated to cats, is also a commentary on the way we treat our furry friends as royalty; diamonds abound in this slot and the reels are set against a backdrop of a a luxurious sparkling red. Basic playing card symbols represent the low value symbols and then we have four moggies as the higher values – a siamese, a tabby, a ginger and a furry white fellow. The Kitty Glitter symbol is the wild and the bowl of diamonds is the scatter symbol. The key to activating the bonus round is to land three of the diamond scatter symbols anywhere on the reels; this will win you 15 free spins which is a good start but the features don’t stop there. When you are playing the bonus round an extra single diamond symbol will appear on reel five; at the bottom of the screen each cat is shown with three empty diamond places next to it – each time you land a diamond it will fill up a slot. When all three slots for one cat are filled that animal will become wild – the more cats you can complete the more wilds you will have to create winning combos. Spinning more diamond cat bowls will award more free spins up to a total of 225. This sparkly wild symbol can help you in the creation of winning combos but only appears on reels two, three, four and five. 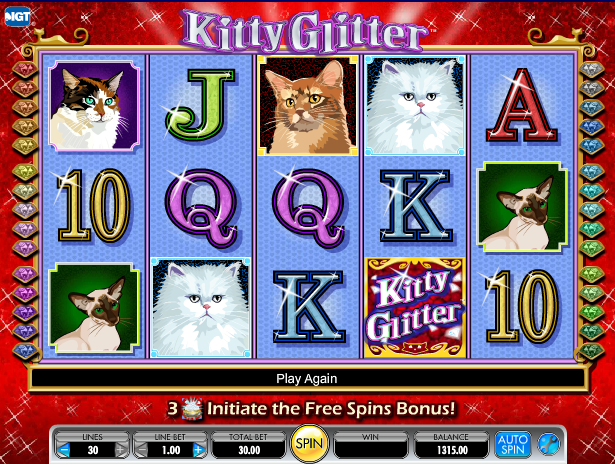 Kitty Glitter is a pretty basic online slot but the cat-related content will appeal to animal lovers anyway. The bonus round is complemented by the extra diamond feature while playing and as cat lovers ourselves, we recommend this game without hesitation.